Seal of Utah encircled in a golden circle on a field of dark navy blue. The Flag of the State of Utah was adopted in 1913 and has the Seal of Utah encircled in a golden circle on a background of dark navy blue. In 1912, the Sons and Daughters of Utah Pioneers ordered a custom made copy of the newly adopted state flag to be showed off to the battleship USS Utah, which was commissioned on August 31, 1911. When the flag came, the group found out that the coat of arms on the flag was in full color instead of white, and the manufacturer had added a gold ring around the shield. Rather than have the flag remade, the Utah legislature changed the law to match the battleship flag, and the flag was showed off to the USS Utah. A bald eagle, the national bird of the United States represents the safety of America. The arrows in the talons of the eagle represent courage in war. The sego lily, the Utah state flower, represents peace. 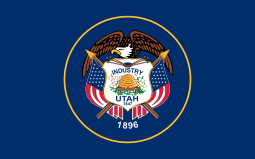 The state motto "industry" represents progress, hard work, and community as does the emblem of the beehive, which is also a traditional Mormon symbol. Crossed Union flags show Utah's support and commitment to the United States. The name, Utah, appears underneath the beehive. The date 1847 represents the year Brigham Young led the first Mormons into the state. The year listed below that, 1896, represents the year that Utah was admitted to the Union. The gold circle around the state seal represents eternal order. The shield underneath the bald eagle represents common defense (military). The design of the seal was adopted in 1850 by the Territory of Utah and changed by the artist "Harry Edwards" when Utah became a state in 1896. According to most descriptions, the flag of the State of Deseret was almost the same to the flag of the State of Utah, but as it was not standardized, many other secular and religious alternatives were also used. This page was last changed on 25 October 2015, at 17:39.